Are curators really just frustrated artists? One senses the pent-up energy coursing through “NUANCE: Recent Paintings by Sherry Cromwell-Lacy” now at the Leedy-Voulkos Art Center. Remarkably, this is the artist’s debut solo exhibition — 39 small- to medium-sized abstract oil and acrylic paintings, produced over the last four years. Cromwell-Lacy, an accomplished curator, educator, and arts administrator, has maintained a persistent painting practice while quietly exhibiting in group shows. As a solo debut, “Nuance” reveals a seasoned artist committed to refining an individual vocabulary of lyrical abstract forms in cool color fields. The artist is clearly fluent in art history. She owes much to Matisse’s cut-outs and generously demonstrates the relationship between collage and painting in “Persian Rug” and “Cosmos.” Both include small mixed-media studies, side by side, with the large finished paintings. They show us how cut paper forms translate to painted ones, how they exist differently in the picture plane when morphed in surface and scale. Cromwell-Lacy’s layered constructions evidence patience. With thin applications of paint, she builds brushy surface textures over sheets and patches of intermingled color. 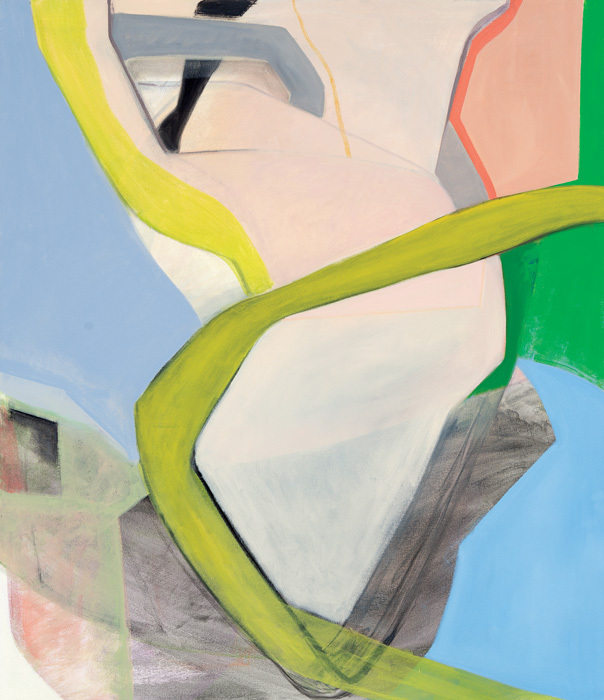 They feel connected beneath the crowded surfaces with strata of dry overpainting and underpainting left visible. Forms emerge from shifting opacities of pigment. 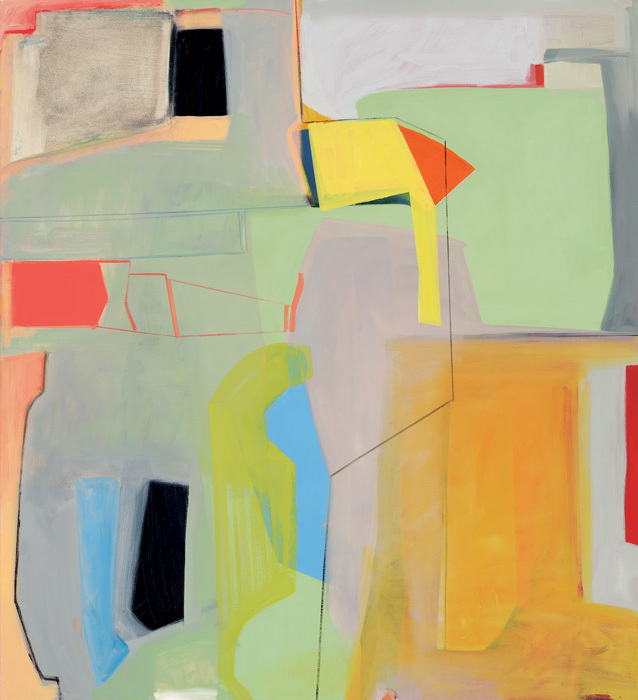 Works like “Rondo” show an artist well versed in postwar American painting — her abstract forms may echo landscape, objects, architecture or interior spaces. 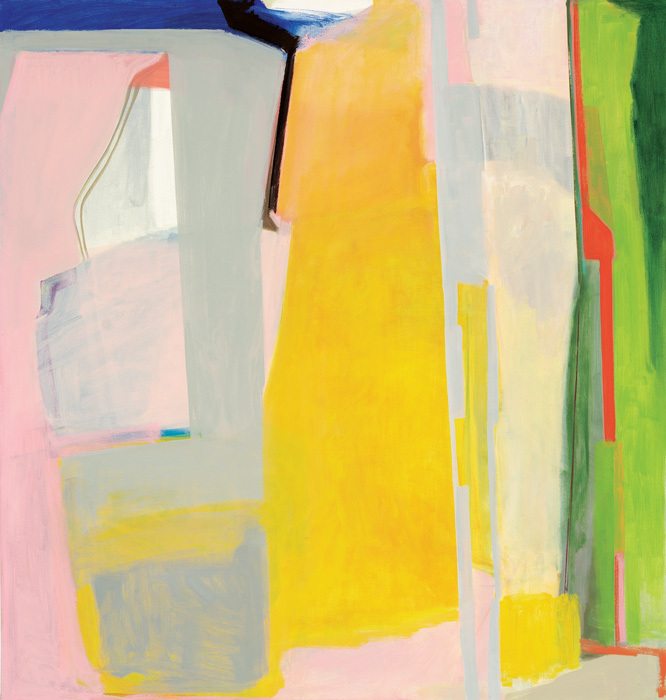 There are hints of Helen Frankenthaler and Richard Diebenkorn, as in the powdery blues, greens, and grays in the oil on canvas paintings “Oasis” and “Archetype.” There are also fleshy pinks of de Kooning and buttery yellows in “La Luz.” The oil on wood panel “Indigo Slips In” takes on a harder edge with darker autonomous color forms a la Ellsworth Kelly. In place of Hans Hofmann’s Abstract Expressionist push/pull rubric, her compositions are driven by arcs, bends, curves, folds, overlaps, twists, veils and wraps. In oil paintings like “Paradox” and “Myth” she leads our eyes around blind corners or off the edge of the canvas. We may try to peel the onion but we never get to the center, as these works conceal their process in semitransparent swaths of modulated color. “Nuance” isn’t all color and light, however. Cromwell-Lacy is not afraid of the dark. Intriguing gaps and portals lurk at the margins of her paintings indicating hidden depths. She explores her dark side further in five works from her “Nocturne” series. Shadowy forms beckon from these small, acrylic-on-panel works. The brushwork is looser, more gestural, adding to the mysterious ambiguity. Cromwell-Lacy distresses the surface blacks with sanding and scratching to allow shades of the gray/white gesso ground to emerge. 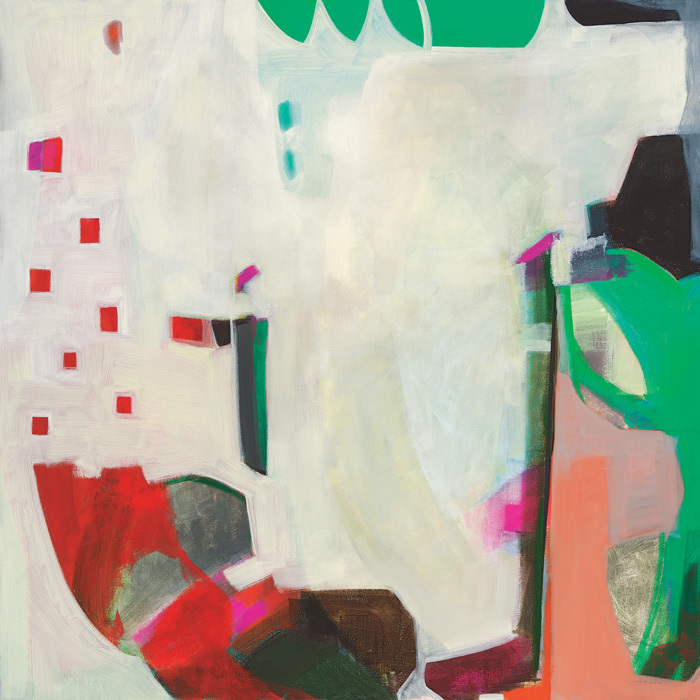 Cromwell-Lacy’s paintings have a musical equivalence with West Coast jazz – they offer moments that are laid back, intimate, soulful, tender, fun-loving, foggy, slightly angular, a bit remote. “Allison’s Blue,” “Kismet” and “Blue Break-Away” even sound like jazz tunes that might’ve been performed by the likes of Chet Baker or Stan Getz. If you take pleasure in painting, it’s worth spending some time with the “Nuance” exhibition. It’s a nice antidote to the winter blues. Cromwell-Lacy proves that curators can capably don the artist’s cap and wear it without missing a beat. 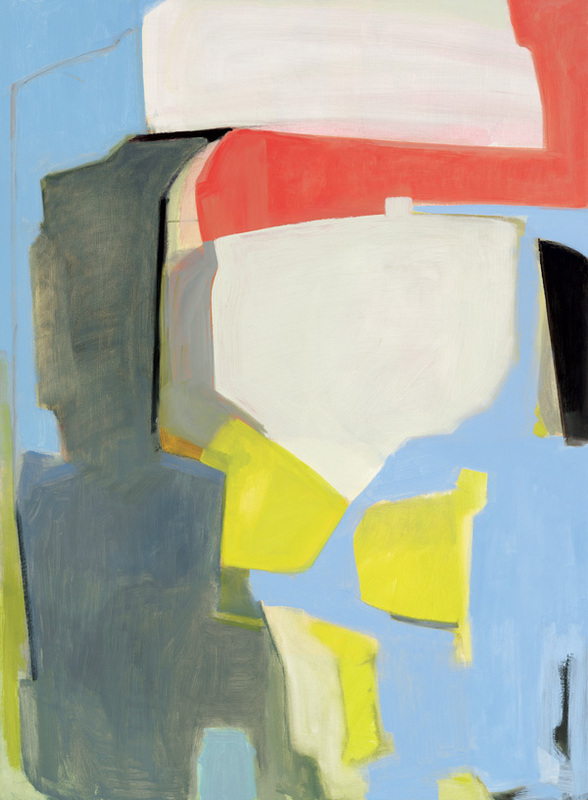 “NUANCE: Recent Paintings by Sherry Cromwell-Lacy,” continues at the Leedy-Voulkos Art Center, 2012 Baltimore Ave. through January 26. Hours are Wednesday through Saturday, 11 a.m. to 5 p.m. For more information, 816-474-1919, www.leedy-voulkos.com. Brian – well done. Thanks for this thoughtful consideration of an important artist.